Which Shakespeare plays are onstage this month? We check in with our theater partners Chicago Shakespeare Theater, Atlanta Shakespeare Company, Shakespeare in Detroit, Chesapeake Shakespeare Company, Commonwealth Shakespeare Company, Gamut Theatre, The Old Globe, and Oregon Shakespeare Festival. We’ve also included a few plays that aren’t straight Shakespeare, but are in someway related to his life or famous Shakespeare actors like Edwin Booth and Ira Aldridge. Keep reading to see photos from different productions. I think that this play is fundamentally about two things. Learning is expressed in so many different ways: knowledge, erudition, being smart, learning, going to school. The four men in setting up their academe are well intentioned—and not entirely foolish. The idea of learning is certainly not a bad thing—it’s just the way they intend to go about it that is so against the nature of their youth. The play asks us to think about what is real learning and real knowledge? In this single play, Shakespeare gives us many different examples of how knowledge can be either shallow and fruitless or can be knowledge that actually leads to something rich in human experience. If you don’t understand your own heart, your own place and journey in life, then all the book learning in the world will mean nothing. Words get used to excuse bad behavior. Words get used to hurt, to punish, to mock other people. Another great theme in this wonderful, giddy play is about growing up, about maturity. Near the very end, the shadow of death passes over the world of the play, and at that point the men only just begin to understand that they must take that step toward real responsibility and maturity, and the women lead the way. Four of our other theater partners staged Love’s Labor’s Lost last summer. See photos from four different takes on the play, from jazzercise to a Rococo garden. Chicago Shakespeare Theater also has a “Short Shakespeare!” abridged production of Romeo and Juliet running through Mar 25. 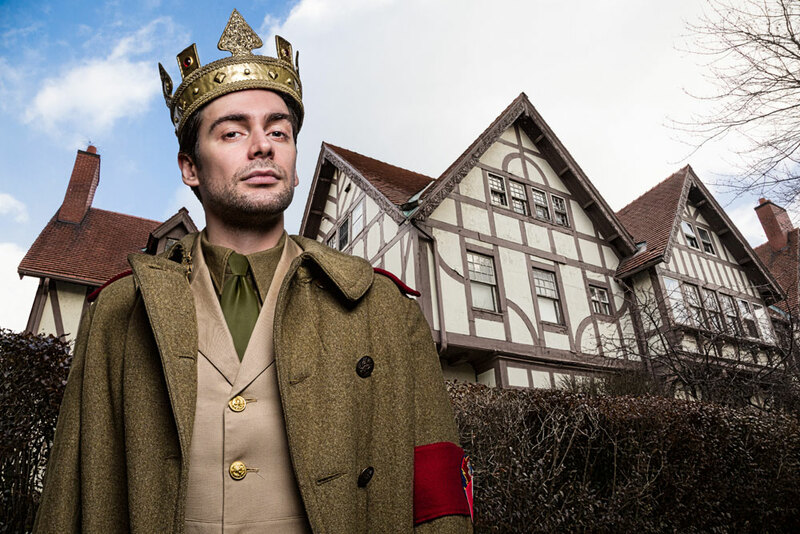 Shakespeare in Detroit opens its fourth season with Henry V, staged at a historic Detroit property, a Tudor home built in the early 1900s. Performances, which are sold out, will take place Mar 23-26 in the mansion’s ballroom, with an ornate chandelier overhead. Joe Sfair as the title character in Shakespeare in Detroit’s Henry V, with the historical mansion where the play will be performed. Photo by Chuk Nowak. Chesapeake Shakespeare Company’s The Taming of the Shrew opens Mar 17 and runs through Apr 9. Related events include a conversation about women in early modern England and a book chat about Vinegar Girl, Anne Tyler’s re-imagined The Taming of the Shrew for the Hogarth Shakespeare series. 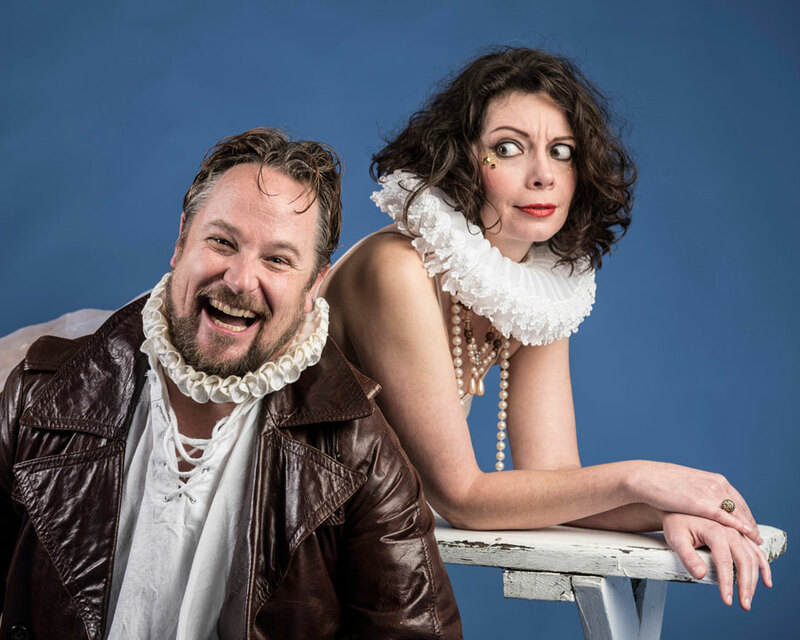 Valerie Fenton is Kate and Ron Heneghan is Petruchio in Chesapeake Shakespeare Company’s production of The Taming of the Shrew, March 17 through April 9, 2017. Photo by Teresa Castracane. Commonwealth Shakespeare Company in Wellesley, MA, presents the world premiere of Our American Hamlet, Mar 23-Apr 2. The play, written by Jake Broder, is “based on the true story of Edwin Booth, the leading Shakespearean actor of his day and the brother of John Wilkes Booth. Less than one year after President Abraham Lincoln’s assassination by John Wilkes Booth, Edwin decided to perform Hamlet on Broadway, a role he had performed in the past to great acclaim.” But would the crowd hold him accountable for the crimes of his brother? These photos are from first rehearsals of Our American Hamlet. At Oregon Shakespeare Festival, you can see Julius Caesar, Shakespeare in Love, and Henry IV, Part 1, onstage through late October. Viola’s (Jamie Ann Romero) cast mates (ensemble) discover her true identity. Photo by Jenny Graham. Mark Antony (Jordan Barbour) is prevented from attacking leaders of the opposing forces by Octavius Caesar (Benjamin Bonenfant, with weapon) and soldiers (Ensemble). Photo by Jenny Graham. Poins (Michael Gabriel Goodfriend) and Mistress Quickly (Michele Mais) are unconvinced by Sir John Falstaff’s (G. Valmont Thomas) account of his bravery during a robbery. Photo by Jenny Graham. Gamut Theatre is staging an educational production of Romeo and Juliet, Mar 17-Mar 26. 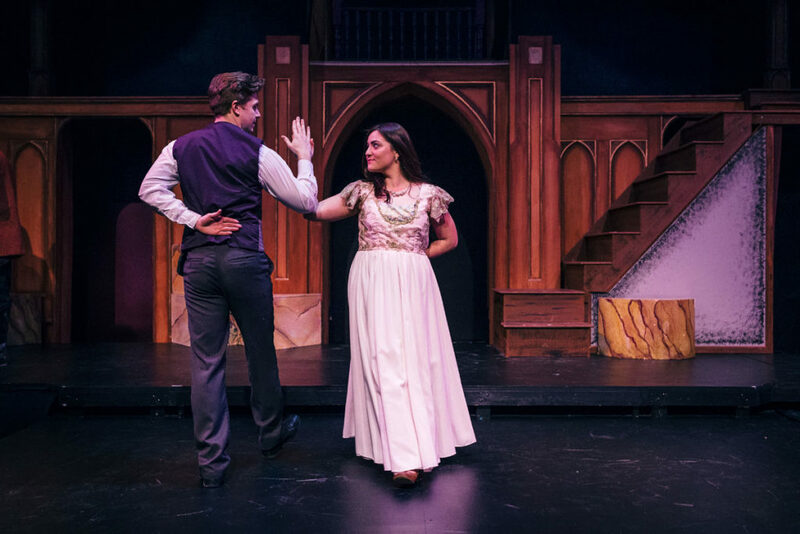 Andrew Nyberg and Gabriella DeCarli in Gamut Theatre’s “Romeo and Juliet,” directed by Melissa Nicholson. Photo by Kelly Ann Shuler. 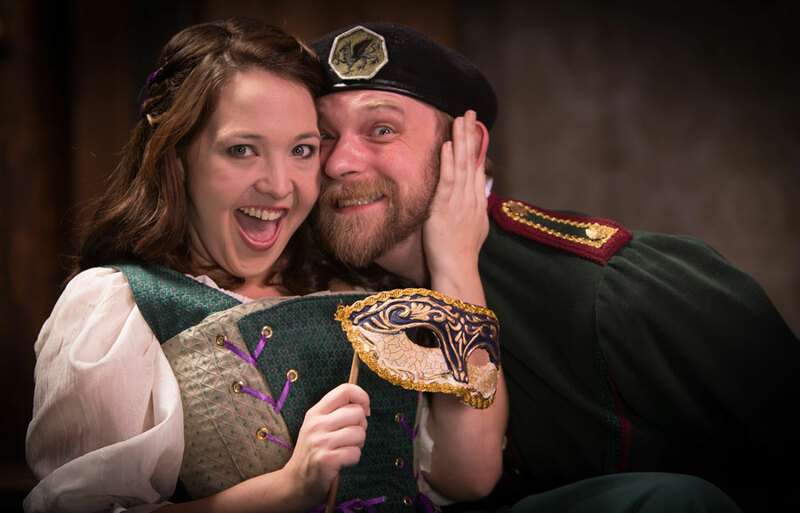 The Atlanta Shakespeare Company at the Shakespeare Tavern Playhouse is performing Much Ado About Nothing, which runs through Mar 26. Chicago Shakespeare Theater, Atlanta Shakespeare Company, Shakespeare in Detroit, Chesapeake Shakespeare Company, Commonwealth Shakespeare Company, Gamut Theatre, The Old Globe, and Oregon Shakespeare Festival are all theater partners of the Folger Shakespeare Library.